[UPDATED] Wages, productivity, progressive policies, and serial correlation: I weigh in on an important, interesting debate. UPDATE: See below, at the end of this post, for Anna Stansbury and Larry Summers’ thoughtful response to my blog. My goodness, a rational conversation…what a strange and rare event these days! There’s an interesting sort of argument going on between Stansbury/Summers (SS) and Mishel/Bivens (MB). My name has been invoked as well, so I’ll weigh in. It’s a “sort-of” argument because there’s less disagreement than first appears. It all revolves around this chart, which plots to the real compensation of mid-wage workers against the growth in productivity. For years they grew together, then they grow apart. The levels of both variables almost double, 1948-73, but since then, productivity has outpaced the real comp of blue-collar, non-managerial workers (mid-wage workers) by a factor of 6. That wedge between productivity and middle-class wage growth has become one of the more important developments in political economy, representing the rise of inequality and the disconnect of paychecks and growth. It’s even on a tee-shirt, produced by the group, Fed-Up. That’s true and even axiomatic, as per the figure above, but SS’s point is that even so, it doesn’t mean productivity growth doesn’t raise median wages. It just means there’s a bunch of other stuff pushing back in the other direction. That’s true too. In a series of regressions of median or middle-wage compensation (the latter is for blue-collar and non-managerial workers, for which there’s a longer time-series) on productivity growth and unemployment, SS shows that the coefficient on productivity is often close to 1, meaning a 1 percent increase in productivity maps onto a 1 percent increase in wages. Again, this doesn’t deny the gap. But it does say growth matters for wages, even at high levels of inequality, weak worker bargaining power, persistently slack labor markets, etc. I’m sure that’s right and it’s one reason why so much of my work in recent years has focused on running full employment, full-growth-potential economies. I’ve written extensively and bemoaning-ly about the productivity slowdown, often trying to push back on those arguing its mostly measurement error. I’ve called it one of the biggest economic problems we face. Just a few weeks ago, I tried to show the critical role slower productivity growth was playing in current wage growth that’s slower than it should be at such low unemployment (see 2nd-to-last figure here). SS focus on the “necessary,” which is fine and important, but in doing so, they create a bit of a straw man by casting those of us who focus on the “not-sufficient” as inadequately committed to faster productivity growth. That’s inconsistent with our writings. FTR, I do think Summers has done a particularly good job in recent years putting equal weight both sides of this equation, lending his heft to not just growth issues, but inequality issues as well (he’s also been on a recent and admirable tear against the awful tax cut plan). I won’t belabor this because the MB response is so thorough and I’ve little more to add. I will, however, underscore one key policy point they make and add a neat econometric point to which I’d like SS to respond. Our contention all along has been that this pay deceleration did not just reflect slower productivity growth, but that it in fact reflected a number of intentional policy decisions that undercut typical workers’ ability to demand and achieve higher pay. One such policy decision was exactly over how aggressively the Federal Reserve and other macroeconomic policymakers should target low unemployment. Others included decisions about whether or not to protect workers’ rights to organize and bargain collectively (the country obviously chose not to) and whether or not to raise the federal minimum wage in line with inflation or productivity growth (again, we chose not to). With this in mind, those who would close that gap, which include SS, MB, and JB (that’s me), would, I suspect, readily admit that we have a lot more confidence in our knowledge of gap-closing policies in the space MB reference above versus ideas to boost productivity growth. The latter, I regret to say, remains largely a mystery to economists. So, pushing for higher minimum wages, full employment (direct job creation), progressive taxation, collective bargaining, overtime rules, gender equity, a robust safety net, more balanced trade, financial market regulation (a complement to full employment—we can’t have them blowing up the economy every cycle), and so on are gap-closing ideas that we know will help. What’s more—and this part is important given SS’s findings—these measures are not anti-growth. The punchline is thus twofold. Of course, 1) faster productivity growth is a necessary component of faster wage growth. But so is 2) re-linking wage growth with the ongoing productivity growth we have. And we know more about how to achieve #2 through progressive policies than #1. First, Biven shared the data with me and I replicated one of SS’s main findings: a coefficient of 1 on the productivity variable in a simple specification of mid-wage comp on productivity growth and unemployment. But they neglect to mention that the residuals are serially correlated in that regression (DW=0.54), implying an omitted variable bias. That’s not surprising: you can’t explain a complex variable like mid-wage comp with just productivity and unemployment. But it is a problem for their trade-off conclusions if what’s missing correlates—shares explanatory power—with productivity growth. Which appears to be the case: when I add an AR(1) term to whiten the residuals, the productivity coefficient falls by half (to 0.5) and DW=1.5. To be clear, that doesn’t undermine their point. The half-a-percent is an elasticity very much worth tapping! But it’s important recognize an omitted variable bias that likely has to do with the “other stuff” in that big gap in figure 1. Second, MB show that much of the juice in SS’s findings come from a period I’m highly obsessed with: the latter 1990s, when true full employment ultimately prevailed, productivity growth was strong, and real pay throughout the wage scale rose quickly, in step with productivity (which is why the correlation drops when you take out that period). This observation does not at all disprove SS’s findings, but it did lead me to think about the role of full employment in these dynamics. I and others have argued that in persistently weak labor markets, employers do not need to uncover efficiency gains to maintain profitability. But in truly tight labor markets, where pressure on labor costs cuts into profit margins, that calculus changes, and in order to avoid higher unit labor costs (comp relative to productivity) and lower unit profits, you’ve got to find efficiency gains. This is the full-employment-productivity-multiplier about which I’ve hypothesized. In this story, the causality goes from full employment to both faster productivity growth and faster wage growth. It also creates non-linearities in the data that complement the missing variable point above. Going for 7 to 6 percent unemployment will do less in the model I’m thinking about here than going from 4 to 3 percent. BTW, this would imply that the current low unemployment rate should be juicing productivity growth a bit. In fact, averaging the past six months, year-over-year productivity growth has accelerated to 1.4 percent, a nice bump, though with these jumpy numbers, nothing you’d want to read much into. And, as noted, wage growth still hasn’t caught as much of a buzz as I’d like to see. It will take both faster growth and much more progressive policy to close the big gap in the figure. On that, I suspect we all agree. We very much appreciate Jared Bernstein’s comments on our recent paper on the link between productivity and pay. As he noted, there’s a lot more agreement than disagreement between our perspectives: on the importance of raising productivity growth, on the problem of the stagnation of typical workers’ pay, as well as on policy approaches towards both of these – all of which he has written about extensively and thoughtfully (e.g. on recent slow wage growth, the productivity slowdown, boosting productivity growth, and in his book the Reconnection Agenda). He raises a couple of points on our paper, on which we’d like to respond. Jared argues that faster productivity growth is necessary but not by itself sufficient to raise living standards, and that by focusing only on the “necessary” part of this argument we risk straw-manning others’ arguments. This certainly hasn’t been our intention, so we think it’s useful to clarify which mechanisms we were looking to distinguish between with our paper. Arguments that productivity growth does not affect typical workers’ wages at all. Instead other factors determine typical wages – and if workers become more productive, the benefits flow to higher-income workers or capital owners. The implication here would be that no matter what reforms are made to rectify inequality, marginal increases in productivity growth will not translate to increases in typical workers’ wages. Arguments that productivity growth is necessary for typical workers’ wages to rise, but productivity isn’t currently able to affect typical workers’ pay because other factors are blocking that transmission mechanism (perhaps factors to do with wage inequality, such as low worker bargaining power). The implication here would be that given the current structure of the economy, marginal increases in productivity growth will not translate to increases in typical workers’ wages, but if certain reforms were enacted, productivity growth would once again affect pay. This is how we interpret the argument that productivity growth is necessary but not sufficient to raise pay growth. Arguments that productivity growth exerts pressure to push typical workers’ wages upwards, but other orthogonal factors have simultaneously been exerting pressure to pull typical workers’ wages downwards. The implication here would be that even given the current structure of the economy and no reforms to address inequality, marginal increases in productivity growth will translate into increases in typical workers’ wages. Few economists subscribe to argument (1). But having seen the chart displaying the divergence between productivity and typical pay since 1973, reasonable economists could differ as to whether they subscribe to argument (2) or argument (3). It’s this distinction that motivated our research and the right answer ex ante wasn’t clear. Having investigated the question in the postwar and post-73 data, we believe there is much more evidence for argument (3) than argument (2) (or indeed argument (1)). The evidence does more than just make the case that productivity growth is necessary for pay growth: it suggests that higher productivity growth even without changes in policy will have substantial benefits for workers (as Jared notes in his blog). Also of course this conclusion does not make the case against policies to promote fairness or redistribution. It’s our view that strategies that focus both on productivity growth and on labor market or redistributive policies are likely to have the greatest impact on living standards for typical workers. Jared also raised a concern with our econometric strategy, to do with serial correlation. Our baseline estimation method uses moving averages, which mechanically introduces serial correlation into the regression. There’s a trade-off here: a moving average strategy is one of the most appropriate ways to get at the low frequency relationship we’re interested in, but by its nature introduces serial correlation. On the other hand removing the serial correlation removes much of the useful variation. We settled for the former and used Newey-West HAC standard errors so that our standard errors appropriately accounted for the serial correlation. Our second set of baseline regressions (Table 2 in the paper) use distributed lags, which are more robust to the concern about mechanically containing serial correlation. We used Newey-West HAC standard errors for these regressions in our paper. We’ve re-done these distributed lag regressions, correcting for serial correlation by assuming an AR(1) error process as Jared suggests. This doesn’t change the coefficient estimates importantly. Whether using these corrections or Jared’s serial correlation-corrected estimate of 0.5 for middle-wage workers, the coefficient estimates we end up with are within the ranges that we concluded were most reasonable in our paper: that a one percentage point increase in the rate of productivity growth is associated with a two thirds to one percentage point increase in median compensation growth and a 0.5 to 0.7 percentage point increase in production/nonsupervisory worker compensation growth (“middle-wage” compensation). Finally Jared discusses the benefits of a high-pressure economy (Larry Mishel and Josh Bivens raised a similar point in their response to our paper). We agree that this is a very important subject, worthy of further investigation – and indeed is closely related to hysteresis issues that one of us has pursued (e.g. 1988, 2014). Jared closes with the comment that it will take both faster growth and much more progressive policy to close the big gap between productivity and typical pay. And he notes that policy-wise we know more about how to reduce inequality than about how to boost productivity. On both points, we agree. Share the post "[UPDATED] Wages, productivity, progressive policies, and serial correlation: I weigh in on an important, interesting debate." 27 comments in reply to "[UPDATED] Wages, productivity, progressive policies, and serial correlation: I weigh in on an important, interesting debate." You are being way to generous to Stansbury Summers. They give equal billing to productivity with a slight of hand in their counterfactual. 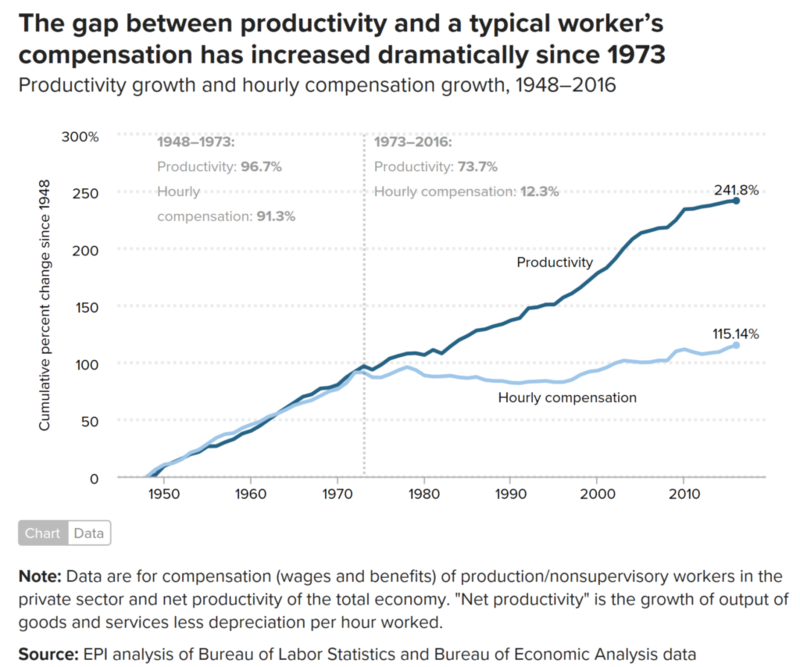 You can not compare productivity increases with 1950 – 1973 with the 1974 -2015 and use the slowdown to say productivity hurt median pay or non-supervisory pay as much as inequality. Even if (as you point out), the productivity slowdown wasn’t caused by inequality, so what? Who in their right minds would argue that it’s easier to foster technological and scientific progress than wage increases? When was the last time Congress passed a law mandating a minimum doubling time for processors? Did anyone tell SS that Moores law is not an actual piece of legislation? Are Summers and Stansbury really that stupid not to consider the slowdown in compensation for the average American wouldn’t affect productivity? Of course the alternative is that they are evil. Stupid or evil, in either case why waste time on them, except to condemn them for their obvious faults. Page 50, maybe “that that” will be corrected, this is from a draft copy. The problem is that it IS easier to foster technological and scientific progress than wage increases. Fostering technological and scientific progress is easy. Just fund technological and scientific progress. This involves a relatively small number of people and can be politically managed quite easily. If anything, the increased wealth produced makes it attractive to the wealthy and powerful. Look at the British funding their high tech navy in the 16th century or the US subsidizing industry through the 19th. History is full of technological and scientific progress without rising living standards. Raising living standards involves a large number of people and will be opposed by the wealthy and powerful who will lose some of their relative advantage. In history, it only happens on rare occasions, usually as a a result of an existential crisis. It might be an internal threat like the Chartists or an external threat like the Axis powers, but only something that threatens the entire social order will convince the elite to spread the wealth. It IS NOT true that science is easier to foster than wages. New York and California are dramatically phasing in higher minimums. Investment in science and technology requires lead time. It is not true that it involves a small number of people or is easily managed. Currently a big part of the problem is that many more people need to be involved. Management difficulties include unreproducible results, safe grant writing, or as one example, see controversy over previous genome mapping project. R & D is vastly underfunded and historically low, private and government spending. But some things take time, as in 2 women can’t produce one baby in 4 1/2 months. While raised living standards may be propelled by a crisis, there are many more examples of revolution to raise living standards than one to raise progress. Essentially, there was only one industrial revolution. Also somewhat ironically, the Summers Stansbury response (see above) closes with my point, the pace of scientific progress is hard to legislate, especially compared to wage and labor regulation. Are you talking about the Summers that along with Olivier at the Peterson Institute present papers acknowledging but discarding inequality as causal in any way? I abjectly reject the notion that rising productivity is necessary for improvement in standard of living with our current conditions of inequality. And I couldn’t care less what Summers thinks of so-called ‘Progressives’. Summers cares more about the Mexican economy than US workers. Why? Is it because he likes them? No, rather it is because his rich friends have such a vast pool of virtual slave labor from which to draw absolutely reliable ROI. Sorry guys, but economics as a profession is politically irrelevant until it fixes the inequality problem and the capital/labor political imbalance. We just don’t care. Notice I said ‘standard of living’ and not wages. Summers is absolutely clueless. I really should have stated this more clearly, but I just rarely find the patience anymore to respond intelligently. Too few people will read what I say and too few will believe it. The cause of SS is unfair trade and the capital/labor imbalance inherent in our trade practices. This is why it is so difficult to grok the statistics to prove the imbalance, because it crosses borders, currencies and political boundaries. I think it is doable, and if I had the money I’d hire a staff to investigate this. If I had the time myself I’d spend it investigating this problem because I think it is probably the biggest political economic problem of modern times. If the problem were fixed, the US would see a rise in median wages and GDP but a temporary reduction in prosperity (defined by the amount of stuff we can consume). One could hope we’d also see a lot of other positive political changes in response to this rebalancing. I most likely will never investigate this further because it would be a path personal destruction. If there aren’t enough people to bring along on the ride, it won’t be helpful to anyone. Nobody would believe it if it were produced by a single person. Here is Krugman saying the same thing, inequality doesn’t matter. He had to change his tune when he wanted to relocate to New York, so he left Princeton for CUNY, where he is a distinguished scholar at the Graduate Center’s Luxembourg Income Study Center, but mostly distinguished by his lack of sympathy for it’s goals. In fairness to Krugman, the current statistics would tend to bear him out, unless you included the million prime working age population who dropped out of the labor force. Keep in mind the 81.6 (check that, because I’m giving it from memory) or 81.8 is a low reached only twice before the great recession unless you go back to a rising trend in 1988. Add them up and you’re something closer to 5% unemployment, which is low, but not full by any means. Also stagnant wages indicate the softness there, though again wages are not supply and demand curve determined, but are influenced in some cases. Yes, 81.6, but I did make a mistake. The number of times it was this low since 1986 turns out to be never. Twice before, once in 2005, once in 2006 came as close as one percent dropping as far as 82.6 percent. I’m very familiar with that post by Krugman. I was pretty upset by it at the time, and I still am upset by it because it is a total cop out. Now in fairness I’ve occasionally said something similar because in theory this is kind of correct in a closed economy. As long is there is some kind of political economic balancing force (like taxes) it is theoretically possible. But theory doesn’t cut it when inequality is destroying our political system. I think Krugman cops out because he claims that economics is not a morality play, but out of the other side of his mouth he says that full employment and growth is the right goals for economic policy. If morality isn’t at the heart of his argument, what is? Why should anyone on earth or beyond care whether we have full employment or GDP growth unless they’re using a moral judgement? It is just a destructive cop out, and in my opinion he takes this position simply to please his friends. No, I’m making a different point, which that Krugman happens to be wrong about the facts as they present themselves. Full employment must take into account slackness in the labor force expressed by prime age labor force participation. That measurement of 81.6, which I’ve repeated so often as to memorize, has not been as low since 1986. It also was never more than 1 percent as low except for a few months in the 2000s and once in the 1990s. The 1 percent is a little less than a million extra people not working. Stagnant wages corroborate the story of less than full employment despite the current unrepresentative number of 4.1 percent. Ironically, Krugman has repeatedly cited the French prime age rate vis-à-vis the American as cause not to cast aspersion on our Gaullic friends. Just to clarify, I’m not saying Krugman is wrong because he ignores the moral considerations of inequality, I’m saying he’s wrong because he doesn’t adequately consider unemployment is not really full, inequality is a major cause, causing stagnant wages, low productivity growth, high debt, inadequate demand. Krugman instead favors Summers interpretation of secular stagnation, and the need for increased deficit spending ad nauseum, greater incentives for business investment, permanently and unrelated to any moral needs to address inequality and low wages. They are either too stupid to see the connection between inequality, or too evil to acknowledge it despite the important platform they’re given to influence policy. You, me, and everyone we know, including this blog have no trouble seeing, or backing up this view with facts, reasoning, and a much more intelligible idea then sec stag. To clarify, Summers Stansbury make no attempt to even consider inequality actually contributes to the slow productivity growth, although maybe close reading of the paper reveals some sliver of doubt? I skimmed some of it, and concentrated on the conclusion. But in my view, inequality is a major if not the major factor in producing sub par performance for stagnant wages, slow productivity growth and poor economic performance in general. The recovery was weak because as Saez cited, the benefits went nearly all to the richest 10, 1, and .1 percent. For Krugman I currently have only the full-employment-making-yachts statement regarding inequality, but I would say that’s enough to cast him as unhelpful, willfully blind and severely negligent. I’ll be honest to say that I don’t read anything Summers writes very closely, because I decided along ago that he is more loyal to his practice and it’s proponents than to the subjects thereof. People like this make claims that their work has a scientific basis while criticism do not, and the bias is clearly upon massaging the egos of those funding their work. I view economics as it exists today as a destructive endeavor, and Summers is one of the most dangerous, destructive practitioners of this ‘science’ (cough b-****). Yes, on the facts Summers and Krugman have no idea what they’re talking about. Either that or they’re part of a conspiracy (a conspiracy to protect their egos and their field of practice above all else). Is this an ad hominem attack? Regardless, I think it is perfectly fair given what we know. Summers has destroyed more countries with his ideas than anyone else I know of. I remember that Krugman post, too, and was quite upset by it. Prior to his Bernie Derangement Syndrome (BDS), I had chalked it up to a blind spot regarding distributional impacts which, I think, can be an occupational hazard for macro. Or, less likely, that he was assuming some redistribution policies that he never named. Now, it does seem more willful. I’m also continually amazed by the contortions so many go through to ignore or explain away the fact that 6 million people simultaneously left the workforce and have not nearly fully returned. They keep dancing around the obvious answer – which, as our host has pointed out, is corroborated by the absence (until recently?) of wage growth – the demand for workers simply has not been there. Disclaimer: I’m not an economist. But to me it looks obvious why pay doesn’t rise with productivity. Machines are doing an increasing part of the work, and the money they earn goes to their owners, not to the persons working with those machines. Perhaps ‘productivity per worker’ is no longer a good way to measure things. Workers are not producing more. Machines are. Shareholders own machines, so they get more and more money. Workers stay behind. Does this make any sense, people who know vastly more about this topic than me? Yep–this is a variation of a coherent theory shared by many economists, though not all (eg, not me!). We call it “skill-biased technology,” meaning employer demands for skilled/highly-paid workers goes up relative to, say, the median worker, as technologies they’re good at enter the workforce. The problem w/ this idea is that a) you don’t see it in the productivity data (if technology/AI/robotics were increasingly replacing workers, productivity would be speeding up, not stuck in low gear), and b) the pay of highly educated workers relative to those with less education hasn’t gone up much in recent years. The cause of the gap between productivity and wages was explained by Hedrick Smith in the 2012 book, “Who Stole the American Dream”, as the result of a political campaign by corporations against workers to influence government policy. The campaign began with Lewis Powell’s 1971 Memorandum to the US Chamber of Commerce prior to his appointment by Nixon to SCOTUS. In the memo entitled “Attack on the American Free Enterprise System”, Powell described progressive politics as attacks such as Ralph Nader’s criticism of the auto industry which Nader shown was putting profits ahead of safety. The memo stated that businesses must respond with their own campaign of “guerrilla warfare” because “it must be recognized that businessmen have not been trained or equipped to conduct guerrilla warfare with those who propagandize against the system, seeking insidiously and constantly to sabotage it.” Powell argued that businessmen must organize and conduct a campaign to fight progressive policies. The Democrats have never understood how corporate plutocracy has funded the GOP, think tanks and professors at universities to create arguments for policies that have suppressed wages since 1970. This thing about things starting in 1971 seems to ignore history, American history, world history and also a bit of common sense. America has a very long history of progressives and business fighting each other, and that included guerrilla war. The reason trend lines changed in the mid 1970s and then more significantly diverged in the 1980s has little to do with a 1971 memo to the Chamber of Commerce, and I would think more to do with unusually high inflation, erosion of manufacturing, effect of women’s continued entrance into the workforce, and the failure of Jimmy Carter’s presidency and the ascendancy of Reagan conservatism, the war of attrition against labor reaching a tipping point, changes in immigration policies. My favorite point to note is the rise of inequality and taxes. Look at graphs from Saez. It roughly matches the divergence in productivity. Likewise look at tax rates, though one has to admit the divergence begins in the 70s and greatest tax cuts take place in the 80s. My main point about your comment is that the history of business and vested interests organizing to combat progressive politics can be traced back to the ancients. Just one example, Ronald Reagan got people’s attention as a force in the political arena speaking for GE, no memo or secret campaign could equal the open propaganda offered to the public. Conservatives don’t really hide their conservatism. It seems like liberals need to come up with a conspiracy theory to explain their defeat. It’s like Hillary whining the Comey and the Russians are to blame, vs. her being obnoxious and disliked (lyrics from 1776), and not conducting normal polling (read some passages of the book “Shattered”). Obviously you don’t understand history because specific historical events pushed by political campaigns have significantly changed public thinking (acceptance of slavery existed for a long time but changed at the Civil War and again with civil rights policy changing again at specific events in time especially in the 1960’s) and therefore the history of public opinion is not uniform. What you seem incapable of understanding is how a political campaign that began in the 1930’s to fight the progressive New Deal escalated in the 1970’s in an organized effort and has operated since then as driven by corporate right wing plutocracy. Reference book – “One Nation under God – How Corporate America Invented Christian America “, details the history since the 1930’s of how right wing plutocrats have managed corporations, the government and the media to attack the New Deal by integrating right wing politics into a fake perverted version of Christianity to support the income and wealth inequality of plutocracy. One of the main causes of inequality is the failure of financial accounting and the government to (1) properly measure and regulate intangible capital (IC) and (2) properly link the value added from public and private IC in workers to worker compensation. Worker IC is largely created with public investments in education such as nonprofit status and private investments by workers in their own IC including knowledge and skills. Worker IC is a major factor that enables productivity from innovation projects and enables most of the revenues and profits produced because of innovation projects that enable the sale, production and shipment of products and services. Since 1992, IC has been a larger part of business investments as a part of GDP in America than tangible capital. About 85% of the value of many S&P 500 companies is IC. Failure to measure and regulate ownership of the flows of worker IC into companies explains at lot of inequality. For example, a large part of a patent (which is a part of IC as intellectual property) is typically derived from the use of worker IC supported with public IC such as federal investments in R&D (NIH, Internet, …). The current GOP proposed change in the tax code fails to recognize that IC is a much larger driver of GDP, business growth and jobs than tangible capital (money from tax cuts). One enabler was/has been expansion of household debt thru securitization and other finance wizardry. The expansion of debt to ~66% of homeowners at commodity prices meant workers did not HAVE to have difficult decisions like taking to the boss about a raise because they could not buy a house. Instead buy it on time. It was not until we tapped that spigot out in 2006 that growth slowed and we had to begin to unwind the overhang. The 1971 memo to the Chamber of Commerce was followed by Buckley v. Valeo, the 1976 Supreme Court ruling that followed a couple years of serious efforts to restrain union membership. That decision suddenly gave business the right to unlimited expenditures in federal elections. In 2016 the AFL-CIO managed about $16 million to influence the election, and the Koch brothers contributed about $800 million. David has met Goliath and lost. Reading this excerpt below in their response, I can only ask.. They need us to tell them that? Really? People, please understand that to whatever degree a nearly completely stagnant economy for 90% of all workers since 1980, with no wage growth (a decline for many large sub groups), to the degree it affects growth and productivity growth, they are full of crap. Well no. Pretty much everyone knows poor and middle class spend money faster than rich people. Those getting the most can also afford to save the most, invest, waste money, bid up costs for everyone, create new luxury markets that may employ few people, or essentially trade high priced worthless items among themselves that counts as economic activity anyway. Also in 1949 Verdoorn tied productivity to growth. Most of this is common sense anyway. The tipoff that Summers and Stansbury have an agenda is that they ignore any consideration in their original paper of the obvious, inequality affects growth and productivity. The surprise would be if it didn’t. Duh. Are they stupid? They need us to point that out? I don’t think so. This whole idea of trying to prove mathematically that half of wage stagnation is caused by historical slowdown in productivity is a big sham. Also, why does the full employment effect of higher wages get mentioned as a cause for business to create efficiency to offset the increase, but the more obvious factor of higher demand from faster growth either from population increase, wage growth, lower unemployment, balanced trade, lower costs of complimentary goods, or other factors not get mentioned? It’s a virtuous cycle too, vs the downward spiral we currently experience. Notice my listing wage growth causing a productivity increase is different from your listing wage growth causing a productivity increase. Mine says higher wages for workers creates more demand for goods which causes business to seek ways to increase productivity to meet demand. Yours says more wages causes business to seek ways to offset the increased costs of those wages. The effects of the alternative scenarios are very different because mine would lead to investment and retention of workers to make up shortfall in demand and yours would lead to investment and reduction of workers to make up demand. Prior to the dramatic rise in inequality of the 1990s manufacturing employment was stable and then just before 2000 it began falling, in two successive waves it lost 5 million jobs. One has to consider both to model how the economy might work, and the effects of less than full employment and stagnant wages on productivity, wage pressure, investment response, and employment. It should be easy to understand that ignoring the different aspect of wage pressure accompanied by rising demand, thus not causing a fall in employment (robots added to workers instead of just replacing workers) is a mistake. Just as important, to understand the above model one has to account for the trade off in growth vs profits. If you play with the numbers, no fancy math is required to see depending on share of the productivity increase divided among employers, employees, or capital, and labor, or management and workers, business and the top 10 percent come out ahead with 1 percent to 1.5 percent slower growth above a threshold of 1 percent a year. They don’t need to plan this for it to happen and them not to complain about current conditions. Why do I get so angry about this? It is because no matter how much evidence piles up that the economy is in a fundamental dysfunction due to the dominance of finance and the capital/labor imbalance (OF POLITICAL POWER!) caused by trade, economists keep playing dumb. They just keep trying to find explanation and excuse that won’t make rich people angry and falsely altruistic people less self righteous. If you see something wrong, fit it! Stop looking for benign excuses, people. I give him credit for responding. I guess if we got his attention I shouldn’t be so rude. The Internet will do that though, and a long history of laissez-faire attitudes towards finance and capital movement helps create the attitude also.